What is an Augmentative and Alternative Communication Evaluation? Did you know October was National Augmentative and Alternative Communication (AAC) month? AAC is a specialized area of clinical services. Here at Easterseals DuPage & Fox Valley, we are very lucky to have several therapists who specialize in helping individuals find their voice through AAC. We have both Occupational Therapists (OT) and Speech-Language Pathologists (SLPs) involved in a multidisciplinary team evaluation to determine the best strategies and/or communication systems to help a child learn to communicate. As an OT, I first became interested in AAC when I was working with a little boy with autism who received a high tech speech output device. It was amazing to see how having his new voice provided so many new opportunities for him. It helped with his overall regulation as he now had a system to share his wants, desires, and needs. AAC looks different from person to person and varies from low tech options, light/mid tech and high tech systems. If you think your child might benefit from AAC, our team evaluative approach may be helpful. Below is more information on what each team member does to best help your child. Many parents often have questions about whether or not a device will hinder their children’s ability to speak. This is absolutely not the case. Research demonstrates that AAC does not keep children from learning to speak. In fact, users will make gains in language AND speech because AAC helps a child connect with others, produce successful communication, and provides consistent speech models. The child I described above, went on to learn a ton of new words after he got his device! When we begin to use AAC with toddlers, it doesn’t mean we believe they are never going to talk; instead, it often means, we believe they need a way to have a meaningful connection to others through a common language which helps serve as a bridge to spoken language. Do try and introduce forms of AAC early. Using AAC can be very helpful for a toddler who is beginning to make gestures, eye contact or sounds to communicate messages, but isn’t yet using spoken language. Often these toddlers are frustrated they can’t communicate certain thoughts and messages. Once they start to see and learn the power of communication through signs, pictures, or more formal AAC apps/devices, they begin to feel a little less frustrated. 3. Model, model, model. When using any type of AAC, we can never model enough. This means that everyone in a child’s life should use AAC too! As with all language learning, AAC is learned because those around the child speak the same language. If you think about it, early communication development (between birth – 12 months) is only modeling – caregivers communicating without any expectation while being connected with their baby using a common language. I love it when my clients bring their devices to therapy. If your child is already receiving therapy services, ask the therapist to use your child’s communication system during sessions to connect and engage with your child. When using AAC, continue to use verbal speech to model and help children understand the pictorial representation of language and develop the words. any adaptations to engage different sensory systems, as well as monitor for sensory overload and/or assist in sensory regulation for device access. The speech therapist is extremely knowledgeable in the vast array of AAC communication systems and AAC strategies available. They will help determine the communication system and language page best suited to bridge the gap between the child’s receptive and expressive communication skills. The evaluations are done in a play based manner to help the child feel comfortable. And play is how children learn! Here at Easterseals we offer a team approach for evaluating children for AAC needs. For children that could additionally benefit from AAC, we will see them for co-treats to help expand their language within play based therapy sessions. When the child’s specific goal is to assist in overall regulation and play to support device access, then a co-treat can be extremely valuable between Occupational Therapy and Speech Therapy. OTs are trained in setting up sensory rich environments to support regulation and drive play. These activities can be very motivating for your child’s communication. There are endless opportunities to model language depending on your child’s unique development. To learn more about Assistive Technology at Easterseals DuPage & Fox Valley, click here. Learning a language is a journey – be it a a first language, a foreign language, a light tech symbols systems (e.g. PODD Communication Books) or a high technology voice output system (e.g. Proloquo2Go on an iPad, NOVA chat 10 or Tobii Dynavox). It begins with one step. A baby hears words for the first year said by all of their family members. The family members repeat these words, use gestures, point to things, say single words over and over words such as “Daddy”, “Up”, “Uh oh”. They focus on favorite words (e.g. “doggie” and ‘Swing”), familiar words (e.g. “bottle”, “night-night”), greetings (e.g. “Hello”) and comments (e.g. “uh oh”). After one year, the first word, a single word is spoken by the baby. When learning a foreign language, the teacher speaks single words, uses gestures and points to items. She focuses on favorite words, greetings, comments and familiar vocabulary first. The same is applied when learning any AAC system. It is another language. Did you know that baby hears 4,000-6,000 words per day for the first year, before they say their first word? This repetition of modeling of language is just as important through a Augmentative and Alternative communication (ACC) device. This can be formally called: Aided Language Stimulation, Partner–Augmented Input, Natural Aided Language or Aided Language Modeling. This means that all of the people in a child’s environment communicate using the AAC communication system. When we support someone to learn to use an AAC device, we talk with the device throughout the day ourselves. We can think about saying favorite words, familiar words, greetings and comments. While doing this we can use gestures, point to things and say single words with the AAC system. By having all of your family/friends involved in saying messages using the AAC system you create a language rich environment, in your child’s language. This language becomes another language in your home that you all speak. The trick is that you and your family are also learning the AAC system. However, every journey begins with a single step. Like a baby learning to speak and like a person learning a foreign language, focus only on one word or one page of vocabulary at a time. The more you talk with the device with this one page or one word, the more your child will hear, see and follow your lead. You can start with a favorite activity, a greeting or with a few favorite actions. Next, find another page to focus on, such as position words, names, questions or places. You can’t learn the device in one day, but the more single words you find, you will see your own AAC vocabulary grow. Your one step is going to be the biggest step of your child’s AAC journey. 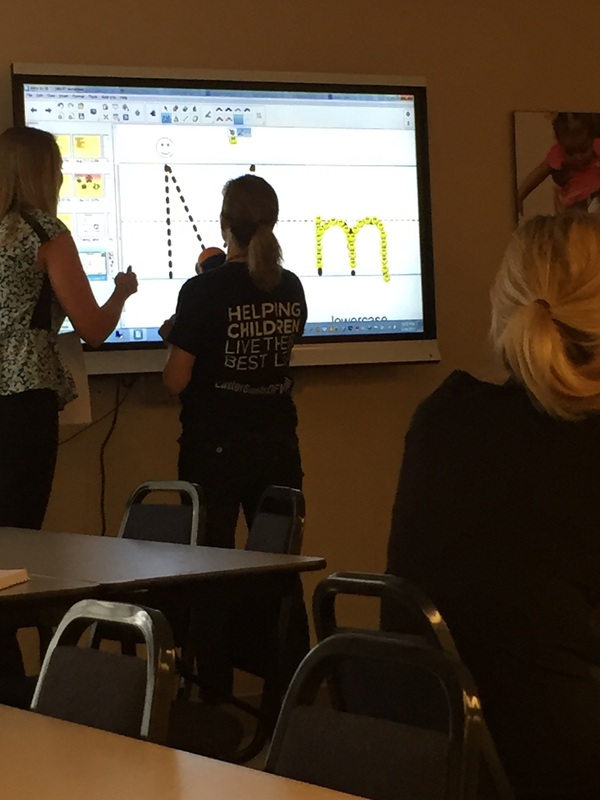 SMARTBoards are now available at Easter Seals DuPage & Fox Valley! This new technology will be utilized for individual therapy sessions, community based therapy programs and classroom based learning in the pre-Kindergarten classroom at The Lily Garden Child Care Center. While SMARTBoards are widely used in schools and have been proven to be innovative in the classroom setting, we know there are numerous applications in the therapeutic setting. There are 4 major advantages of bringing this technology to children of all ages in a therapeutic setting. The SMARTBoard provides a multi-modal learning experience for children. With typical instruction, educators can be limited to mostly auditory learning with supplemental visual supports. Using the SMARTBoard, children have access to auditory, visual, kinesthetic, and tactile learning by being able to physically interact and conceptualize topics in new exciting ways. Studies have revealed higher learning outcomes as educators are given a platform to prepare and execute their ideas and materials more efficiently. With increased efficiency of materials presented and engagement from children, studies have shown improved performance outcomes and efficacy for achieving treatment goals. The SMARTBoard gives you flexibility to utilize many forms of media. Using articles, pictures, and videos creates exceptional involvement with a child using applications that are of deep interest and captivation. Many SMARTBoard users have created their own materials and have shared them for others to download for free use. The SMARTBoard software also provides a variety of materials which saves preparation time for therapists. With a variety of products available, the SMARTBoard hardware is suitable for a variety of abilities and assists in bridging the gap for those who have motor, visual, hearing, attention deficits, etc. It also encourages companies to go green, as this is a web-based medium. Therapy materials are available online and can be shared or stored without producing physical materials. Unlike Apps, the SMART software is completely adaptable to meet the needs of specific individuals and their learning needs. Using technology is innately engaging for children of this generation while still providing targeted hands-on learning. Additionally, by having the ability to touch and change the sessions as you go, sessions can be stripped down to the most functional level for children of all abilities, simplifying the learning process. 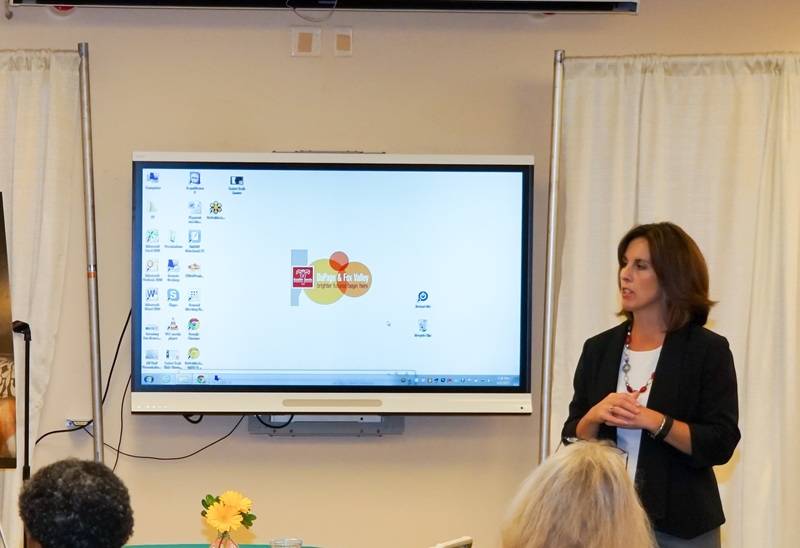 The SMARTBoards have four touch points, allowing a therapist and client or multiple clients in a community based therapy program to touch and learn together. The games are so fun, the child doesn’t realize they are practicing new speech patterns or movements as part of their therapy goals. 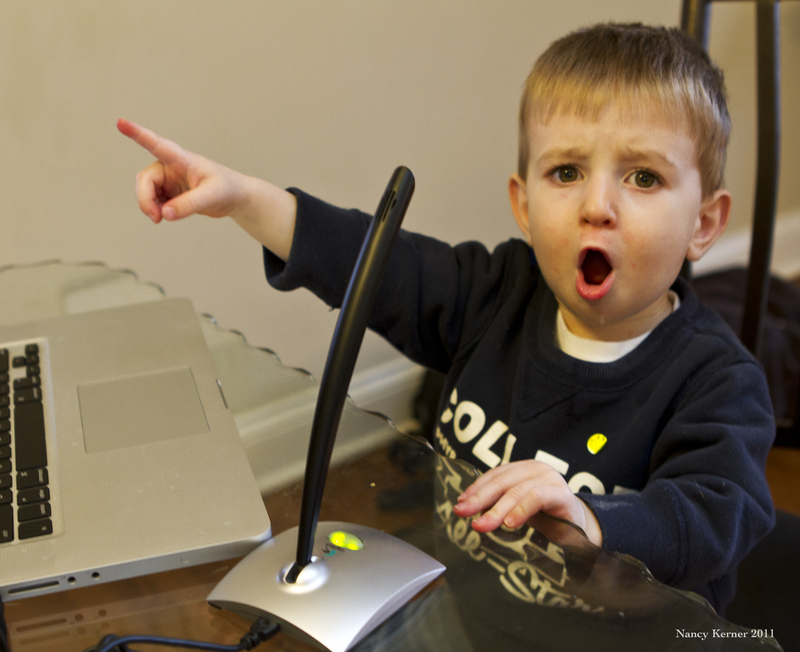 Two-year-old Frank vocalizes the word “duck” while playing with a computer laptop and recorder. Frank attends weekly speech pathology sessions at Easter Seals DuPage & Fox Valley to help with issues that stemmed from food allergies and delayed truck core strength. After a year of therapy, Frank is now quite a talkative young boy! My son talks, why is the SLP recommending a speech generating device? My son doesn’t fit this profile! Won’t that device stop her talking and make her too lazy to talk? There are many myths around the use of augmentative and alternative communication (AAC) in individuals of all ages but these myths are particularly prevalent with our young children. Below are the most common concerns (myths) that I continue to hear from families and professionals, especially those working with young children. I want to dispel the myths with the realities surrounding the concerns. MYTH: The AAC system will become a crutch for my child. Parents are frequently concerned that their child will use the device instead of learning to communicate verbally. REALITY: Many children’s verbalizations increase when they begin using a voice output AAC device. Research and clinical practice continue to indicate that AAC does not interfere with verbal speech and actually encourages spoken language. We frequently see increased imitation and spontaneous verbalizations when children use augmentative communication systems. Children will communicate with the easiest and most flexible means available to them. It is easier to use verbal speech when possible than it is to create a message on a communication device. MYTH: The term ‘augmentative communication’ refers only to devices with voice output. REALITY: There are many different types of augmentative communication with and without voice output. Some types include using objects, photographs, picture symbols such as Boardmaker or SymbolStix, gestures and manual signs. Other types are low tech battery operated single message voice output devices with as few as one message. Mid tech devices are available with multiple message selections. High tech devices are also available with robust language organization that can be modified for various stages in a child’s receptive and expressive language development. Tablet systems such as iPads have a variety of communication apps from single messages to full robust language organizations. Frequently, children’s full communication systems include a combination of no tech, low-tech and high-tech AAC, in addition to their unaided communication including verbalizations. MYTH: Individuals must progress through a specific hierarchy of skills before they are ready to use augmentative communication or before moving to the ‘next level’ of augmentative communication. REALITY: There are no prerequisites for communication. A child does not need to understand cause-effect before he/she can use AAC. A child may actually learn cause-effect skills through the use of augmentative communication while she is learning new forms of communication. A child does not need to know that a picture represents an object. When a picture is attached to a voice output device or to a low tech surface, the child will begin to associate meaning between the picture and the object she receives when she selects the symbol. For example, if you attach a picture symbol of ‘bubbles’ to a single message device, your child touches the picture and hears the message ‘bubbles’, then you blow bubbles for her, in time she will begin to associate the picture of bubbles with the actual bubbles. MYTH: AAC is a last resort and we are giving up on my child’s speech. REALITY: A child’s use of AAC can enhance speech, language and communication development while reducing frustration at the same time. Ideally, augmentative communication strategies should be introduced and implemented prior to communication failure in order to prevent communication failure. When AAC is introduced early, before increased frustration and communication failure occur, a child may naturally incorporate the system into their typical communication repertoire. Receptive and expressive language skills can be modeled using an AAC system. It is never too early to begin to incorporate AAC strategies into a child’s communication development. When introduced early, AAC can provide a strong foundation for a child’s receptive and expressive speech and language development. MYTH: My child speaks and AAC is only for people who are completely nonverbal. REALITY: AAC systems and strategies may be used as primary communication systems or as supplemental/augmentative systems for individuals. Many children are verbal and have trouble being understood by unfamiliar listeners or become frustrated when a familiar listener doesn’t understand a spoken message when the context is not known. It is important to remember that individuals with complex communication needs should have the opportunity to use augmentative communication strategies if they are not able to say what they want or need, share an idea or story, offer their thoughts, ask questions, tell you that they are afraid and what they are afraid of, and tell you if they are in pain. Augmentative communication can provide a means for them to share these types of messages to more people in more places more often.It is never too early to introduce AAC into communication intervention. There are no prerequisites for communication.